Bolder, brighter, slimmer … How are you looking for 2013? Forget falling leaves and frosty mornings, you know it’s autumn when the phone-book-sized fashion magazines start bowing drugstore shelves. Influenced by a mix of street, snowboard, popular and especially outdoor athletic fashions, ski wear may not be couture, but it has its hot trends and styles. No surprise then that bright, rich colours—like indigo and fuchsia—are popular, but none more so than lime. The strong colour trend runs down into pants, too. Forget basic (or boring) black, coloured bottoms are on more slopes across the country this year, especially if they contrast the jacket. “People are pushing the envelope more,” says Karen Laughland, softgoods buyer for Whistler-Blackcomb. 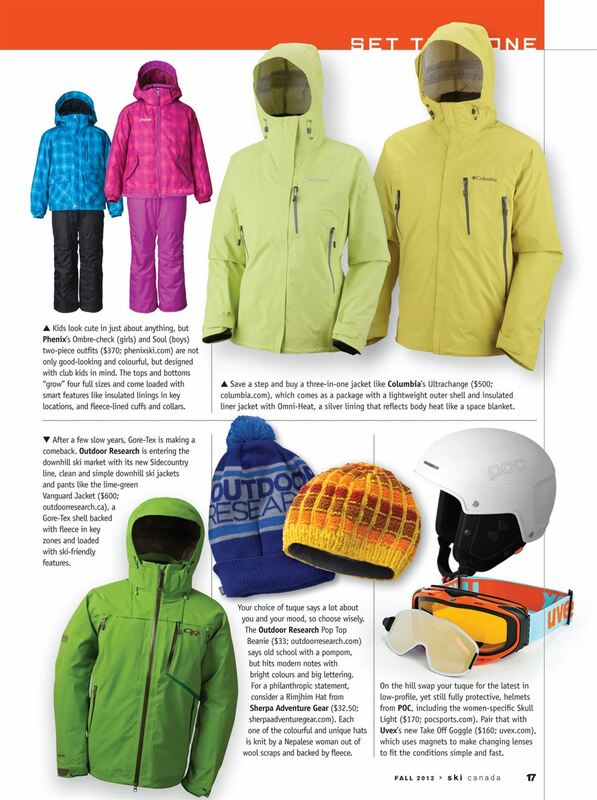 “They’re taking care in what they put together and making a statement with their ski wear. Frankly, it’s refreshing.” Translation: expect more crazy and fun prints and patterns and bold colour combinations. In the western freeride scene, popular colours are only slightly more toned down—with relatively conservative navy, burgundy and burnt orange replacing the bolder colours in eastern Canada. “Not earth tones yet, but heading that way,” adds Steve Saranchuk, owner of Fresh Skis in Calgary. Saranchuk says the two-sizes-too-big-hanging-below-the-knees look is giving way to “just baggy” for jibbers, while just about everyone else in Canada can expect more fitted and slimmer jackets and pants. Luckily, built-in stretch means going streamlined, not sacrificing the ability to bend over. Big puffy down jackets are also shrinking in favour of thinner, lighter and slimmer insulated sweaters and hoodies. 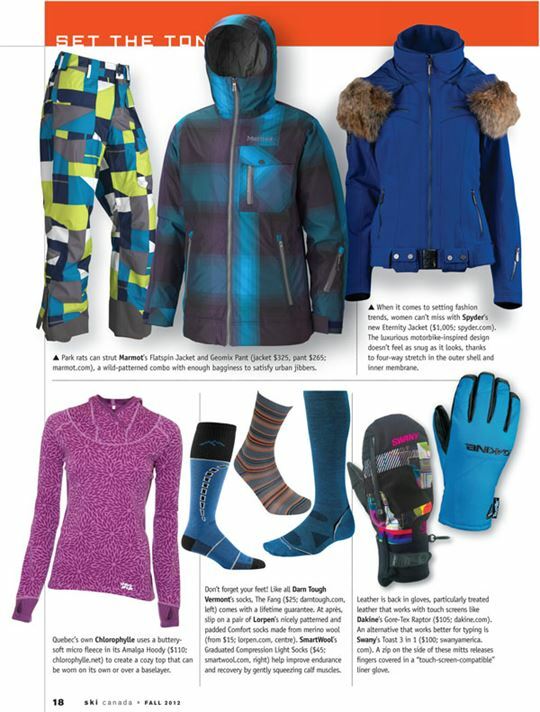 The outdoor mantra of layering, rather than one thick heavy layer, is catching on with the all-mountain skier. 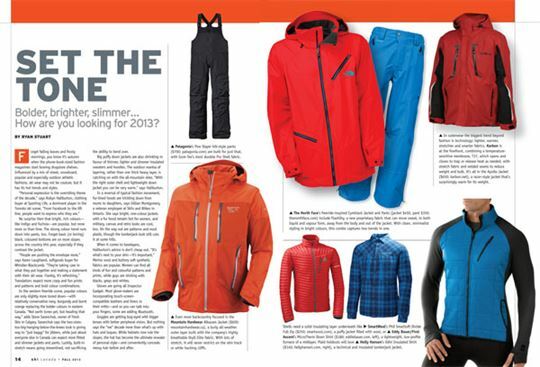 “With the right outer shell and lightweight down jacket you can be very warm,” says Haliburton. In a reversal of typical fashion movement, fur-lined hoods are trickling down from mums to daughters, says Gillian Montgomery, a veteran employee at Skiis and Biikes in Ontario. She says bright, one-colour jackets with a fur hood remain hot for women, and military, canvas and retro looks are cool, too. On the way out are patterns and most plaids, though the lumberjack look still cuts it at some hills. When it comes to baselayers, Haliburton’s advice is don’t cheap out. “It’s what’s next to your skin—it’s important.” Merino wool and buttery soft synthetic fabrics are popular. Women can find all kinds of fun and colourful patterns and prints, while guys are sticking with blacks, greys and whites. Gloves are going all Inspector Gadget. Most glove-makers are incorporating touch-screen-compatible leathers and liners in their mitts—and so you can talk into your fingers, some are adding Bluetooth. Goggles are getting bug-eyed with bigger lenses with better peripheral vision. But nothing says the “me” decade more than what’s up with hats and tuques. While helmets now rule the slopes, the hat has become the ultimate revealer of personal style—and conveniently conceals messy hair before and after. Patagonia’s Pow Slayer bib-style pants ($700; patagonia.com) are built for just that, with Gore-Tex’s most durable Pro Shell fabric. Even more backcountry focused is the Mountain Hardwear Alkazam Jacket ($600; mountainhardwear.ca), a burly all-weather outer layer built with the company’s highly breathable DryQ Elite fabric. With lots of stretch, it will never restrict on the skin track or while hucking cliffs. In outerwear the biggest trend beyond fashion is technology: lighter, warmer, stretchier and smarter fabrics. Karbon is at the forefront, combining a temperature-sensitive membrane, T37, which opens and closes to trap or release heat as needed, with stretch fabric and welded seams to reduce weight and bulk. It’s all in the Apollo Jacket ($650; karbon.net), a racer-style jacket that’s surprisingly warm for its weight. The North Face’s freeride-inspired Cymbiant Jacket and Pants (jacket $450, pant $350; thenorthface.com) include FlashDry, a new proprietary fabric that can move sweat, in both liquid and vapour form, away from the body and out of the jacket. With clean, minimalist styling in bright colours, this combo captures two trends in one. Shells need a solid insulating layer underneath like SmartWool’s PhD Smartloft Divide Full Zip ($250; smartwool.com), a puffy jacket filled with wool, or Eddy Bauer/First Ascent’s MicroTherm Down Shirt ($180; eddiebauer.com, left), a lightweight, low-profile furnace of a midlayer. Plaid holdouts will love Helly Hansen’s Odin Insulated Shirt ($140; hellyhansen.com, right), a technical and insulated lumberjack jacket. Kids look cute in just about anything, but Phenix’s Ombre-check (girls) and Soul (boys) two-piece outfits ($370; phenixski.com) are not only good-looking and colourful, but designedwith club kids in mind. The tops and bottoms “grow” four full sizes and come loaded with smart features like insulated linings in key locations, and fleece-lined cuffs and collars. Save a step and buy a three-in-one jacket like Columbia’s Ultrachange ($500; columbia.com), which comes as a package with a lightweight outer shell and insulated liner jacket with Omni-Heat, a silver lining that reflects body heat like a space blanket. After a few slow years, Gore-Tex is making a comeback. Outdoor Research is entering the downhill ski market with its new Sidecountry line, clean and simple downhill ski jackets and pants like the lime-green Vanguard Jacket ($600; outdoorresearch.ca), a Gore-Tex shell backed with fleece in key zones and loaded with ski-friendly features. Your choice of tuque says a lot about you and your mood, so choose wisely. The Outdoor Research Pop Top Beanie ($33; outdoorresearch.com) says old school with a pompom, but hits modern notes with bright colours and big lettering. For a philanthropic statement, consider a Rimjhim Hat from Sherpa Adventure Gear ($32.50; sherpaadventuregear.com). Each one of the colourful and unique hats is knit by a Nepalese woman out of wool scraps and backed by fleece. On the hill swap your tuque for the latest in low-profile, yet still fully protective, helmets from POC, including the women-specific Skull Light ($170; pocsports.com). Pair that with Uvex’s new Take Off Goggle ($160; uvex.com), which uses magnets to make changing lenses to fit the conditions simple and fast. Park rats can strut Marmot’s Flatspin Jacket and Geomix Pant (jacket $325, pant $265; marmot.com), a wild-patterned combo with enough bagginess to satisfy urban jibbers. When it comes to setting fashion trends, women can’t miss with Spyder’s new Eternity Jacket ($1,005; spyder.com). The luxurious motorbike-inspired design doesn’t feel as snug as it looks, thanks to four-way stretch in the outer shell and inner membrane. Quebec’s own Chlorophylle uses a buttery-soft micro fleece in its Amalga Hoody ($110; chlorophylle.net) to create a cozy top that can be worn on its own or over a baselayer. Don’t forget your feet! Like all Darn Tough Vermont’s socks, The Fang ($25; darntough.com, left) comes with a lifetime guarantee. At après, slip on a pair of Lorpen’s nicely patterned and padded Comfort socks made from merino wool (from $15; lorpen.com, centre). SmartWool’s Graduated Compression Light Socks ($45; smartwool.com, right) help improve endurance and recovery by gently squeezing calf muscles. Leather is back in gloves, particularly treated leather that works with touch screens like Dakine’s Gore-Tex Raptor ($105; dakine.com). An alternative that works better for typing is Swany’s Toast 3 in 1 ($100; swanyamerica.com). A zip on the side of these mitts releases fingers covered in a “touch-screen-compatible” liner glove. Not shown: To achieve optimal next-to-skin comfort, Helly Hansen combined its HH Warm and HH Dry technology to wick and insulate in the new Odin Hybrid bottoms and tops (top $120, bottoms $90; hellyhansen.com). In the wool department, Icebreaker’s Bodyfit collection of tops and bottoms (from $105; icebreaker.com) are snug, soft and handsome.